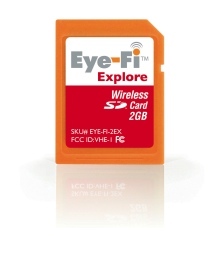 Eye-Fi Explore looks like a typical SD Card, but it's actually a 2GB storage and wireless device that can add geographic location labels to your images. In other words, maybe we finally have an easy way to geotag our images. I haven't tested this yet, so I'm not sure how it works. But I am interested. If anyone has additional info, please post a comment. From what I've read it uses GeoTagging data from the SkyHook Network, which is the same thing the iPhone uses for positioning. This mean you'd need WiFi and an internet connection for it to work, unless Eye-Fi is using some tricky software which saves WiFi data and gets the location later. I don't think it'd be the best method for geotagging especially because the WiFi chip can't be too strong meaning you won't pick up as many points in the same area as you would on an iPhone. Though I'd love to be proven wrong about that! Also Derrick, which email should I use for asking about a signed plate? is it picking up true location data or is it merely tagging location based on the location of the wifi source used to upload the images to the server? what do you bet it's the latter?